The team’s revelation of the year, Jake Hill has a keen sense of the finish line. After our biggest year to date, Mars Hill wants to let you know how we ended up and what we foresee for the future. We’ve officially crossed the finish line of the 2012-2013 collegiate season. Time to breathe, reflect, and plan for the future. With the team competing in all five disciplines (road, track, mtb, cross, and BMX), it was our most ambitious and exciting year to date. We took teams to all five national championships in Utah, Texas, New Mexico, Wisconsin, and Arizona. Just getting teams to every nationals was a huge accomplishment and major logistical hurdle. We landed on 10 national championship podiums and had a lot of fun competing, ending the year as the #2 ranked team in division two, a title based on performances at all five collegiate nationals. We were #1 for the last two years but decided it would be nice to give someone else a chance. Congrats Colorado Mesa University. We tried to beat you, but you were too strong. 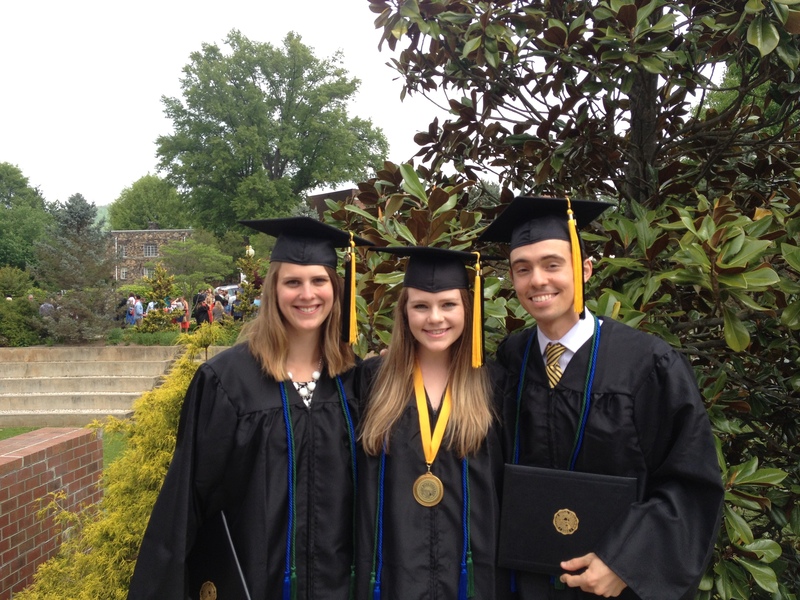 Laura Rice, Stephanie Bunnett, and Michael Robinson at graduation. Also graduating from the team were Logan McGiboney and Steven Bryan. Our biggest accomplishment of the year, however, is graduating five riders who raced with the team during their tenures at Mars Hill College. Plus, we’ll have two more earning their degrees over the summer. That’s what it’s all about, and we wish them all the best in their future endeavors out there in the “real world.” We’d love for them to stick around a bit longer, but our riders tend to graduate on time or early. We hope their experiences on our cycling team have provided a foundation for building workplace and professional teams in the future. 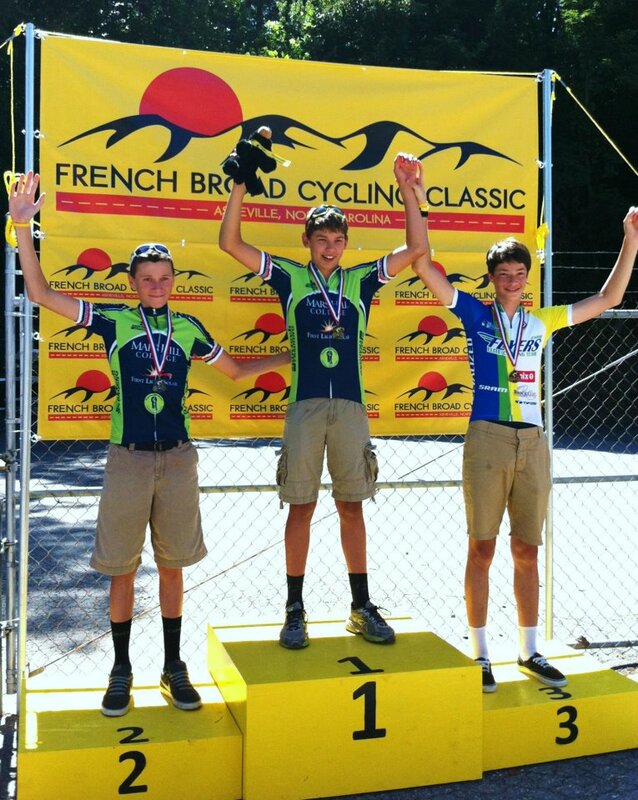 Jordan Lewis and Blake Johnson, campers from last summer, stand atop the FBCC podium. 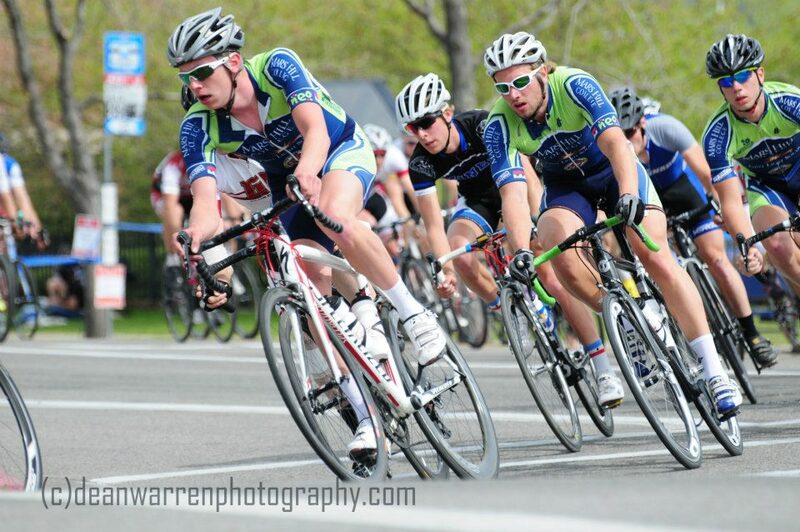 Great pic of the boys doing their jobs at Collegiate Road National Championships. Next fall, the team looks forward to hosting both conference mountain bike and cyclocross races. More on these events as they materialize. We also look forward to the next three years’ schedule for collegiate national championships. For the last four years, nearly every championship has been out west and/or at altitude. None have been on the east coast, let alone the SE. Now it’s looking like we may get a turn. Many regional schools are celebrating that mountain bike nats will be in Banner Elk, NC, for the next two years. And it was announced that road nats will be in Richmond in 2014 as a test event ahead of the 2015 UCI World Road Championships. We already know that Asheville will host cyclocross nats in 2016, which will be amazing on the Biltmore Estate. South Carolina’s Giordana Velodrome looks ripe for more championship action too. 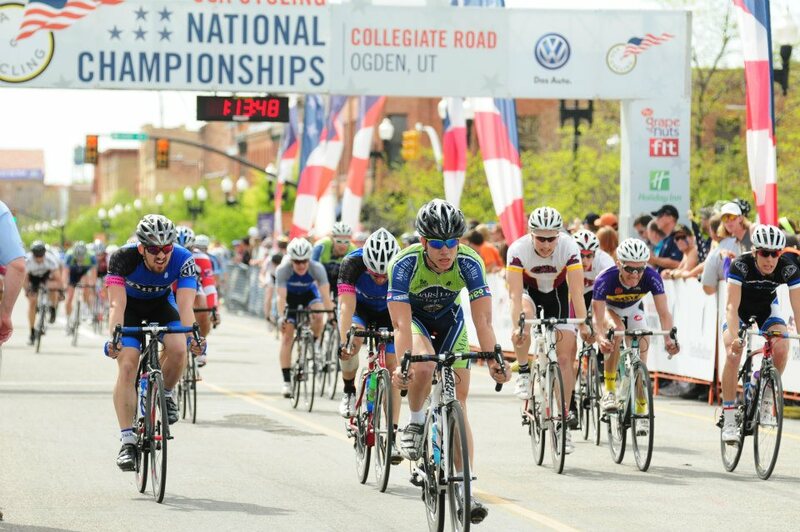 We’re also excited about possible locations for collegiate road nats in 2015-2016 too, and we have high hopes they’ll end up somewhere in our neck of the woods. Thank you! to sponsors and supporters this year. We are fortunate to have so many. Forgive us if we missed your name (and please let us know). Just know that Mars Hill Cycling loves you!